The Laupahoehoe Train Museum andVisitors' Center opened on March 1, 1998, and celebrates the story of Hawai'i's railroads, plantations, tsunami's, and the rich history of the Hamakua Coast. A labor of love by the community residents, this museum is housed in the old station agents home, on the site of the Laupahoehoe Train Station. The home has been lovingly restored and is beautifully furnished in the period of the early 1900s. 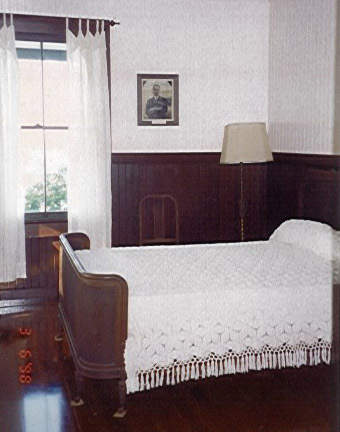 Photos, memorabilia and stories fill the rooms and help bring the past alive. Out in the back yard is an area known as the wye, which was hidden from view until the community reclaimed it from the viney overgrowth. Community members and Kulani Inmate Community Servicemen cleared over 50 dump truck loads of green waste from the yard uncovering some rail and the switch stand, rusting for more than 50 years. The wye is an area where an engine's direction could be switched. Here a replica standard gauge caboose, a newly restored narrow gauge boxcar and diesel switch engine are on view. The diesel switch engine has been made to run again after escaping the scrapper. We run him on tour days and special occassions, but no rides are given...sorry. Our narrow gauge boxcar has been newly restored using as much of its original steel as possible. This boxcar was reportedly, a track mate to Rusty, running on the same (sugar) plantation lines for a mill in Haina hauling explosives. Our standard gauge replica caboose has been completed after many years of waiting for funding and manpower. The interior will have additional displays for those interested in climbing on board, but remember this is a work in progress. We have a dual gauge system to accomodate our rail stock of both gauges. We have research to support dual gauge being used in Pa'auilo where the end of the standard gauge line met with the narrow gauge sugar line. This is why we don't feel bad about borrowing the idea for the museum rail. Everything you see in the model train room was donated to the museum. In 2004 we received a HELCO grant to bring electricity into the old carport. We were then able to close it up to be used as additional display space. The center ‘N’ gauge display designed, built and donated by Neil Erickson, originally represents the Hilo Railroad-Hawaii Consolidated Railway line along the Hamakua Coast. Doug Cullinane, a volunteer angel from Arizona, came and reassembled it and finished the interior of the train room. The static HO gauge model on the wall was created by Stan Heggland and won a National Golden Spike award for its design and craftsmanship. The N gauge work in progress by the door is being done by Ted and Heiki Wolf. It will eventually be able to run and represents the tunnels we had on the Hilo Railroad-Hawaii Consolidated Railway line. The HO rail yard with turntable or switching display was donated by Betty and George Mertyl. It shows how the ‘wyes’ and switches worked in a rail yard as well as how the turn table operated. We invite all train enthusiasts to come and check this room out. Our gift shop, while small, boasts a wide selection of Laupahoehoe Train Museum logo items including;t-shirts, sweatshirts, hats, pins, and patches. Many of our items are hand-crafted by local residents, and are not readily available anywhere else. Other clothing, books, videos, pottery, leis, artwork, and other Hawaii-made treasures provide unique gifts and memories. A great book titled "April Fool's," published by students at Laupahoehoe School, features stories from survivors of the deadly April 1, 1946 tsunami that so strongly affected the history of this community. We are one of the smallest museums in the state but as small as the museum is we have had over 5000 visitors this year with our numbers rising yearly. Visitors have come from nearly every state in the U.S., and many countries, including China, Japan, Germany, England, Canada, Australia, and Samoa. And people didn't just visit; many recalled times and places of long ago, and shared their memories with us. 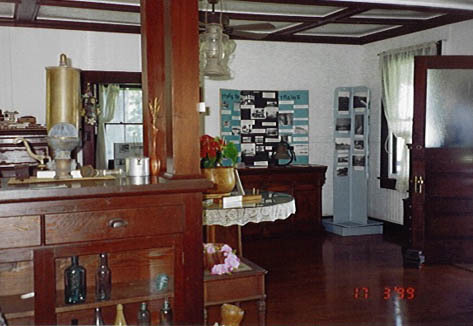 Many of our visitors have donated to the museum railroad items, memorabilia of days gone by, and news of the old days. Many people explore the information presented for research, others for family geneologies. Clearly, the best part for the museum are the stories of railroad life on the Island of Hawaii. Those stories and remembrances of rides or employment are few and far between. We augment those stories with the many stories that come from around the globe on railroad life, this helps us to better tell the tales of our railroad history. Some of these accounts have been added to our collections,and are now available for others to enjoy! In the beginning, being a community run museum meant residents in the immediate area would work to create the museum.Given all the donations and contributions from all over the world that add to the growth of the museum we have to extend our idea of community to all over the world. We are so grateful to all of our visitors, donors and contributors for keeping us on the right. Comments in our guest book are a testament to our visitors' enthusiasm and to our community's accomplishments. They include: "Terrific little museum…"; "Keep up the good work…"; "Very informative…"; "Such a nice stop…"; "Outstanding accomplishment…"; "Wonderful historic sharing…"; "Really nice exhibits…"; "Lucky to see these treasures…"; "You are doing a wonderful job…"; "Wonderful project…"; "Looking forward to seeing your progress…"; and many more positive comments. 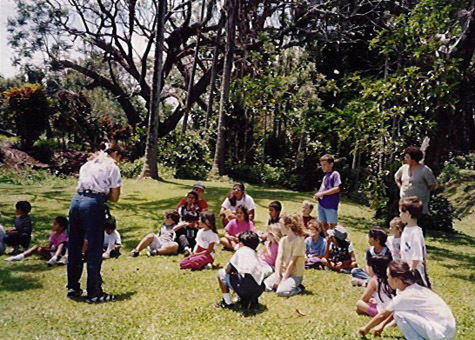 The museum is funded by admissions, donations, memberships, and aloha. Project grants have allowed us to do some projects at the museum, such as restore the track, engine and caboose. Grant funds have also allowed us to work on a safe walking trail off the main highway on an old stretch of road down to Laupahoehoe Point. We have also followed our purpose by assisting in or providing social, civic and educational activities and events along the coast. The quest for artifacts, photographs and other memorabilia is ongoing! This is a community run museum but it has been built from the inside out by the community. Without the community's generousity and sharing we would not have the collection we have today. Many photographs are still archived in the Lyman (Hilo) and Bishop (Honolulu) Museums. As funds become available we will broaden our collection of display photos. New display boards have been acquired and are being improved as photos are purchased or donated. Documentation of personal recollections of the railroad, and other memories of life on the Hamakua Coast, is in progress via cassette and video tape. Throughout the yard we are adding to existing plantings with an emphasis on Native Hawaiian vegetation. We are also working toward a small garden railroad in the yard as pieces of track and equipment become available. Come celebrate our progress with us!! !